Renting a storage unit at All Storage can be a sweet experience, and that’s what inspired longtime customer Darla Wardlow to have something truly special baked up for the staff at the Yukon, Oklahoma All Storage location. About three years ago, Wardlow was looking for some extra space for a business she had started with her daughter. The business, called Ruby’s Vintage Rentals, offered up vintage furniture rentals for weddings and photography. As anyone who has ever owned vintage furniture knows, large antique items require plenty of space along with climate control. Wardlow and her daughter were looking for exactly that at the right price point. As a small business owner, Wardlow also appreciated having easy access to her storage unit. During her time as a tenant, Wardlow noticed how attentive and friendly the staff at All Storage was. When the time came for Wardlow to discontinue her business and move out of her storage unit at All Storage, she wanted to do something special for the staff that she had come to know during her time as a customer. 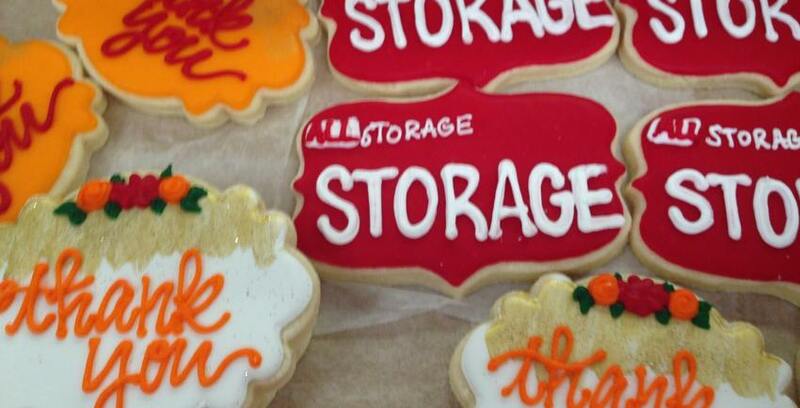 She contacted local Oklahoma business Cookies by Sydnie and had custom cookies made with the All Storage logo. It was because of the above and beyond style of customer service that she herself wanted to show her gratitude with above and beyond cookies.